When I begin building a bike, my first priority, no matter what I plan on using the bike for, is comfort. If I’m not comfortable on a bike, I won’t ride it. I enjoy what riding does for me mentally and physically so much that I don’t want to deter from that experience with something nagging me that can be addressed. First things first, you need to be on the best size frame for your size. For most people, that means going to a bike shop and at the very least riding a few bikes to see what feels best for you. The other option is to actually be fitted for a bike at a shop by someone trained in how to do so. There is usually a charge for this, but it can be very helpful. I know that I want to be pretty upright when I ride, even on a bike with drop style handlebars, so I don’t want a frame with a longer top tube. Women specific bikes often have a shorter one. I am of average height at 5’6” with a 30” inseam, so I can ride a lot of different frames, including most mens frames. You can request a more upright stem on all bikes or handlebars with some rise or a sweep back to get you up higher on a bike. A good bike shop will be willing to work with you to swap out parts and lengthen cables to allow for this. I use a triple crankset on the front with chainring teeth in the range of 42-30-26. This is widely variable, but I have found this is a perfect range for me. On the back wheel, I use a wide range 12-36 tooth cassette which gives me a very easy set of climbing gears. The higher the number of teeth in the rear and the lower the number of teeth in the front, make for easier gearing. If you are a strong rider, this is not as necessary, but for me it’s a godsend. I prefer bar end shifters mounted with adapters on my handlebars as they are very simple to adjust and use. This is kind of old school, but I love their simplicity. Many touring bikes are still sold with bar end shifters just for this reason. I use straight style handlebars with a curve and a backward sweep so that I still have two different hand positions and can change periodically to prevent fatigue. 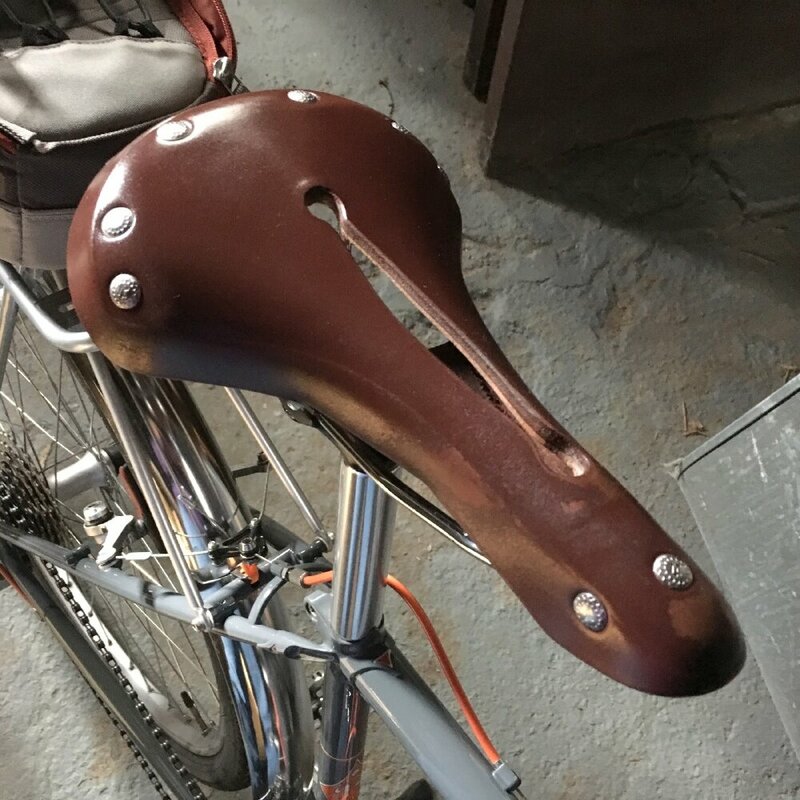 Saddle choice is a highly individual matter. Some people are fine on almost any kind, others try many before finding a winner. My true favorites are the Selle Anatomica X Series and the Rivet Pearl. Both are leather with a cutout and have a lot of give right out of the box. These saddles are made to move with your sit bones as your ride. They, like many saddles, are not cheap, but if you ride a lot, worth the investment. Lastly, I prefer a wider tire, again for comfort. I know many people say wider tires make you slower and I am not going to argue the point. I just know that I go as fast as I want or need to on 32-38 mm tires vs the stock 28,25 or 23 mm tires that are standard on most road and many hybrid bikes. I also feel more stable on a wider tire in changing road conditions. This is a lot of information, but winter is a good time to think about what you can do to make your bike better for YOU, or to purchase one that really suits your style of riding. Bike shop mechanics have a lot more time during the offseason to work on your bike and get it just the way you want it.